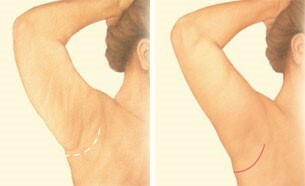 Arm lift, or brachioplasty, is a surgical procedure that reduces excess sagging skin that droops downward and tightens and smoothes the underlying supportive tissue that defines the shape of the upper arm Fluctuations in weight, growing older, and heredity can cause your upper arms to have a drooping, sagging appearance. This is a condition that cannot be corrected through exercise. Arm lift surgery may be right for you if the underside of your upper arms are sagging or appear loose and full due to excess skin and fat. Incision length and pattern during arm lift surgery depend on the amount and location of excess skin to be removed. We will discuss this at your consultation. Your incisions will be closed either with absorbable sutures, or stitches that are usually removed within one to two weeks following your arm lift. The smoother, tighter contours that result from brachioplasty are apparent almost immediately following your procedure, although there will likely be swelling and bruising. You will be given specific instructions on how to care for the surgical site and drains, medications to apply or take orally to aid healing, specific concerns to look for, and when to follow up in the office. The decision to have plastic surgery is extremely personal, and you'll have to decide if the benefits, risks and potential complications of arm lift surgery are acceptable. You will be asked to sign consent forms to ensure that you fully understand the procedure.